Wild game is an excellent source of all-natural protein that’s pesticide and antibiotic free. Plus, it’s leaner and contains less saturated fat compared to traditional store bought meats. Sure, the nutritional facts alone are reason enough to eat more wild game. But, the truth is that the intoxicating aroma and delicious flavors are far too heavenly for our palates to resist and all the health benefits associated with eating wild game play second fiddle, at least for us. 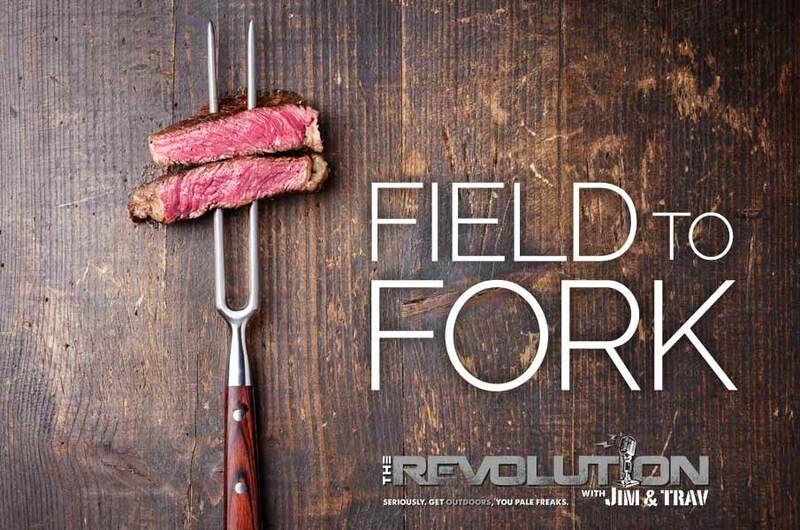 So, this week on The Revolution with Jim and Trav presented by Outdoor Channel, Sportsman Channel, World Fishing Network and MyOutdoorTV, we're taking our wild game from Field to Fork with tried-and-true tips to better grill, fry, roast and smoke our hard hunted, and earned, meats. Joining us will be Scott Leysath of The Sporting Chef, Eva Shockey from Jim Shockey's Hunting Adventures, the hosts of The Lindsey Way David and Jeff Lindsey and the President and CEO of Hi MTN Seasonings Hans Hummel. Eva Shockey has established her place in the outdoors as one of the industry’s leading women. Her tremendous online following faithfully checks in to see where she is hunting, what gear she is using, what public appearances she is making and they also get a taste of how she uses all the wild game meat stacked in her freezer. Joining Jim and Trav this week on The Revolution, Eva says, “I love cooking wild game, I cook it all the time.” Eva talks about the field to table movement and how her appreciation of the game she hunts is evident every time she cooks a meal. Eva will then talk about becoming an author with the release of her new book this fall. Keeping the details under wraps until the official unveiling next week, Eva gives us this insight into her book, “The book is about empowerment, doing what you love, following your passion and going against the grain.” She’ll talk about her passion for encouraging and empowering girls and women to get involved in the outdoors. “Hopefully a lot of girls will look at me and go, if she can hunt I can hunt. And that’s exactly what I want. I want them to try hunting, get outdoors, pick up a bow, pick up a gun and do exactly what they want to do. And that’s my main goal.” Tune in to find out more about Eva’s favorite game to eat and her best recipe, as well as more on her upcoming book. See Eva on Jim Shockey’s Hunting Adventures on Outdoor Channel and listen for her this week on The Revolution. When it comes to taking your wild game and transforming it into delicious table fare, Scott Leysath, The Sporting Chef, is your man. He is the host of The Sporting Chef on Sportsman Channel and is the leading authority on proper preparation of fish and game and he joins The Revolution this week with some simple but delicious recipes for fresh fish. He’ll begin with a crash course in fish and chips with his Boston-style beer-battered fish and chips. Scott says the secret to frying fish is to make sure the fish and the batter are very cold. He’ll talk about beer choice, proper seasoning and how to fry. He’ll then talk about a really versatile way to use fresh fish with his catfish wrap with avocado and tomato salsa. Scott says the great thing about a wrap is that just about anything can go in it and in this case, spicy crispy catfish is paired with a creamy coleslaw and an avocado and tomato salsa. Finally, Scott says that trout, compared to other fish, doesn’t have a lot of flavor. So, he’ll give step by step instructions on how to turn your catch into Trout Cakes or how to cook fresh trout, stream side, right over the campfire. David and Jeff Lindsey are the hosts of The Lindsey Way on Sportsman Channel. They’re passionate about hunting mature whitetails and big game. Not the kind to boast or brag, the Lindsey’s humbly talk to Jim and Trav about some of their trophy deer, but say the real goal is to hunt mature animals and a trophy rack is just a bonus. The Lindsey’s are also avid elk hunters targeting big mature bulls. “There’s nothing like September in the elk woods. The rut, bugling bulls and it provides so much meat.” David and Jeff say that their favorite red meat is elk and that the bulls they harvest fill their freezers for the year. Tune in to find out why they grind a substantial portion of the elk meat they harvest and what their favorite venison recipe is.